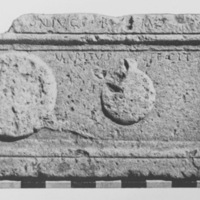 Fragmentary tombstone from Gerasa (2nd - 3rd c. CE) with relief sculpture showing personal effects, including mirror. Made by unnamed husband for his "wife of good merit." Welles, C. 1938. "The Inscriptions," p.451, no.217, Pl. CXXXVIII:e, in Gerasa: city of the Decapolis, C.H. Kraeling (ed.). ----- her husband made (this). Reported in Gerasa Museum (inv. no. 91) by Welles (1938). 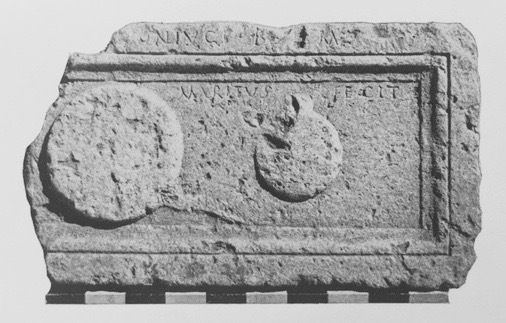 “Tombstone of the "wife of good merit" (GER0201),” WIRE: Women in the Roman East Project, accessed April 24, 2019, http://www.wireproject.org/items/show/3.